From classic rock to Disney favorites the Phoenix Symphony’s 2016-2017 season has musical events for everyone to enjoy! 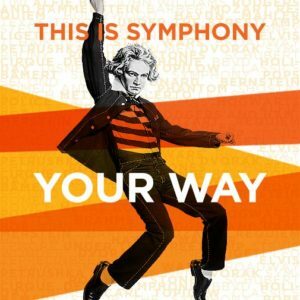 Covering fan favorites from chart-topping artists including David Bowie and The Beatles to bringing Beethoven’s Symphony No. 9 to life, the Phoenix Symphony offers something for every musical taste. Founded in 1947, the state’s largest performing arts organization strives to make the arts accessible to all Arizonans. The Phoenix Symphony offers a wide variety of concerts each season from classics, to one-of-a-kind specials and dynamic family events in downtown Phoenix as well as throughout central Arizona. The Phoenix Symphony offers a night filled with awe-inspiring music and an experience not soon forgotten. Here’s a selection of the Symphony’s upcoming schedule. Enjoy the classics – of rock that is. Rock out to the Music of Journey, David Bowie and The Rolling Stones. Each concert features chart-topping hits from the legends of rock and roll like they’ve never been heard before. Kick-off this holiday season when The Texas Tenors ride back into town. The Valley favorites return this Thanksgiving weekend to spread holiday cheer. Have a Frank Sinatra fan in the family? Treat them to an unforgettable evening by attending Simply Sinatra, a tribute to the music of Frank Sinatra featuring astounding vocalist Steve Lippia. Relive Beatlemania! Live and Let Die features hit songs from The Beatles and Paul McCartney’s solo works. Hear favorites like “Hey Jude,” “Penny Lane,” “Let It Be,” and many more. Don’t miss Beethoven’s most celebrated masterpiece, Symphony No. 9, featuring the famous “Ode to Joy” performed by The Phoenix Symphony, The Phoenix Symphony Chorus and talented soloists. The first half of these powerful special performances at Symphony Hall features three fiery and majestic works from Richard Wagner including selections from Lohengrin, Die Meistersinger von Nürnberg and Tannhäuser. Tito Muñoz closes his third season as Virginia G. Piper Music Director with a program of Haydn and Mahler masterworks. The Haydn’s Symphony No. 45 program opens with Franz Joseph Haydn’s “Farewell” Symphony, offering a fitting finale to the season with its experimental forms, unexpected wit and poignant conclusion. Click here to see the Phoenix Symphony’s full 2016-2017 season schedule.